We have now passed the 28 week mark, a major milestone for us. There was much rejoicing this weekend in our household. 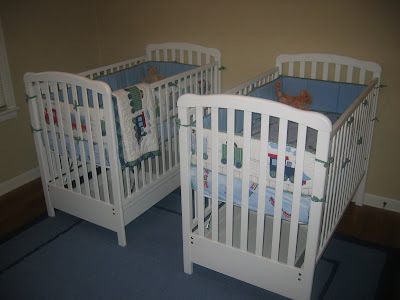 We spent most of the previous week setting up the nursery. We still have a long way to go, but the major components are in place thanks to JenMom for the furniture and my parents for the transport service. All the gifts we received from the baby showers are starting to fill the cribs, closets, dressers, and overflowing into other rooms. Strollers, swings, car seats, entertainment centers, and much more have been assembled in anticipation for our big, big day (one "big" for each baby). Thank you all again for your generosity. As you can see from the pictures, Duke decided to get in on the action, being the ever-inquisitive puppy that he is. Don't worry, the sheets will all be washed thoroughly before we use them. 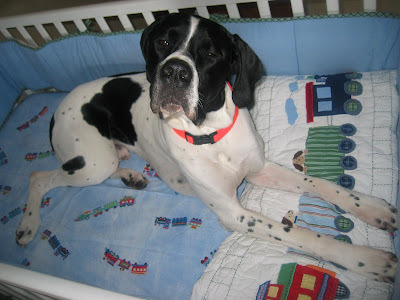 We love the crib bedding from the Pottery Barn, and Randi's mother is coming this weekend to sew us some crib skirts and curtains from similar material. Wow, as mundane as this is, it is so much better writing about than some of the subjects of the past couple months. We have more belly shots of Randi, I am coming up with a top ten Second Trimester list, we go for growth scans tomorrow, and we have names finally picked out. We will hopefully be able to get it all on the blog this week. Praying for you guys here in Alabama! So happy for you and everything looks great!!! You don't know me....I learned about you from JenMom. I consider myself the Oreo Mom.....having had 1 child, then twins and then another. My twins are the double stuffing! I too, had a troubled pregnancy, but God choose me to learn valuable lessons through the pregnancy, and then while raising them. (and I'm still learning) I think of you everyday and pray for you. My twins arrived at 32 weeks with our son being 4pds. even and our daughter being 4pds. 1/2 oz. Don't let anyone discourage you. Doctors are wonderful, but God is all powerful to do the unspeakable! Daily prayers and blessings to you!!! Love the bedding! A beginning to an adorable room, for your two blessings!